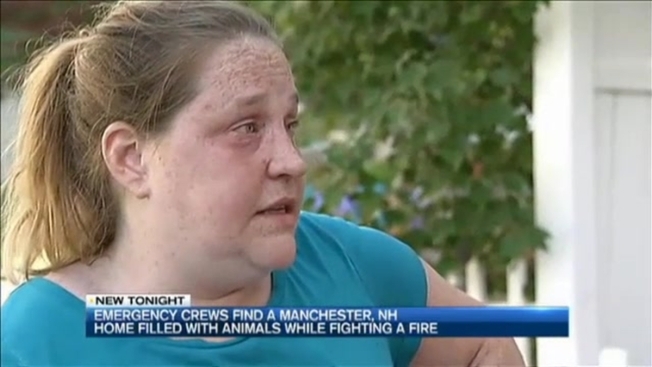 A woman was hospitalized when her home, filled with more than 20 animals, caught fire Wednesday in Manchester, New Hampshire. It was a shocking discovery for firefighters. "The conditions were deplorable inside the house," said Manchester Fire District Chief Al Poulin. "Feces were found throughout the entire structure of the house." The fire at the Patricia Lane home was caused by a commercial pet dryer that malfunctioned. "We found there were 15 dogs, six birds, a large pot-belly pig and a cat," Poulin said. Three people live in the house, but only one woman was home at the time of the fire. Jessica Mitchell, the 41-year-old homeowner, was rescued by firefighters as she tried to save the animals. Mitchell suffered from smoke inhalation when she went back in to try to rescue a group of dogs and was transported by ambulance to Elliot Hospital. The Manchester Health Board says she now has 10 days to clean up the house. "When you have that many dogs, it's constant, you're always picking up," said Mitchell. "It just happens and you have to go through and clean every single day." Firefighters say they found one dog "contained to the basement" because it "didn't get along with many of the other dogs, and we found out, many of the firemen." Mitchell used the home as an in-home pet sitting and grooming business, according to firefighters. But she says she no longer runs it. "I did run a business out of here and the dogs destroyed the house, so I stopped doing that," she said. "Just doing it for friends here and there." One cat was also found dead, firefighters say. It's unclear if it died in the fire. All the other animals have been removed by animal control. "Its heartbreaking, it's just completely heartbreaking," said a teary-eyed Mitchell. "I take care of them. They all need medication, every single day they need medication, we have rescues, we have everything." She was also asked if she had too many animals inside. "I've come to the conclusion that they can go, and maybe it's a little too much," she said. Mitchell says she now wants the pig to go to farm, and she says her sister will take the birds. She says she would like to keep some of the dogs. Manchester Police Wednesday aren't commenting, so it's unclear if any charges will be filed, or if Mitchell will get any animals back.